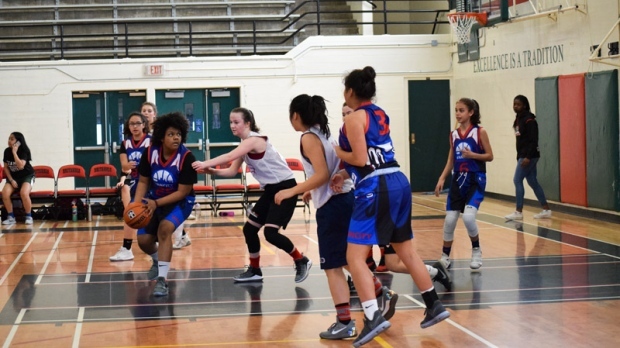 The U17 Vancity Reign girls basketball team plays a game against the Vancouver-Strathcona basketball club at Britannia Secondary Schooll on March 15, 2018. 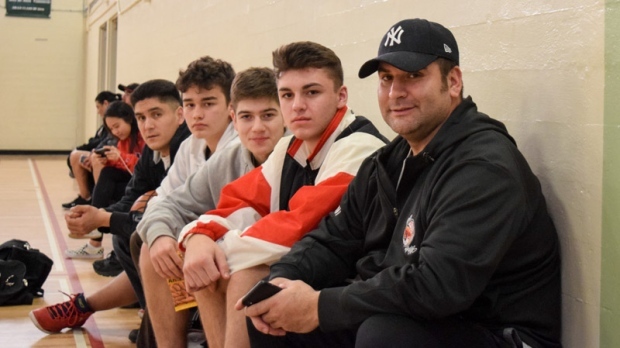 Teenage basketball players on two Indigenous club teams in Vancouver are preparing to compete in a massive tournament that’s being held in the city for the first time. The Junior All Native Tournament is a competition between young Indigenous basketball players from all over B.C. Many teams represent a certain First Nation or village, but others, like the teams practising in Vancouver, comprise of players from many different nations. 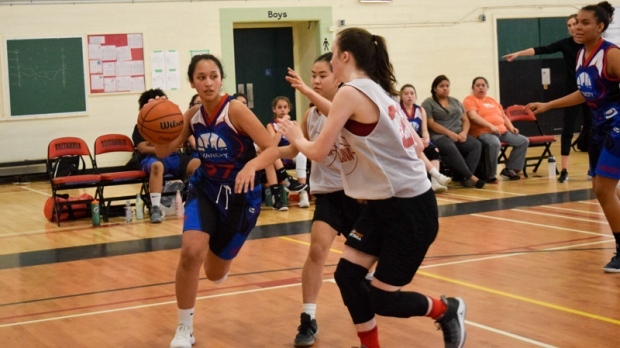 In the gymnasium at Britannia Secondary School on Thursday, Bruce’s team finished their practice and settled in to watch the girls team, the U17 Vancity Reign, play a game against the Vancouver-Strathcona basketball club. Karalee Antoine, number 27 in blue, says the annual Junior All Native Tournament is something she looks forward to every year. Bruce, who has roots in the ‘Namgis First Nation, is a well-rounded athlete who’s been offered lacrosse scholarships to universities in the U.S. But first, he wants to help his team defend their championship title during the last year he’s eligible to play. The JANT has been happening for over 40 years, but organizers think this year’s event will be the biggest ever. There are 83 teams and over 1,300 players registered. Chris McKnight, Vancity Sons coach, estimates 5,000 to 6,000 people will come to the city for it. 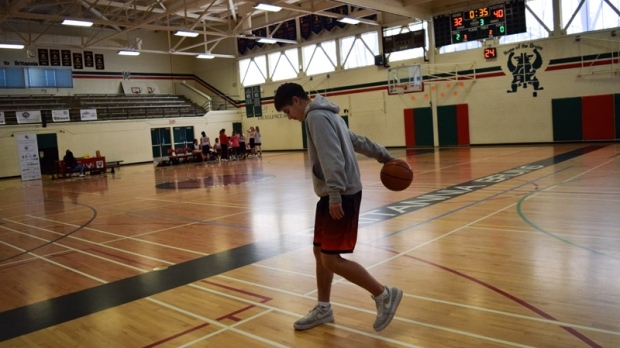 Organizers are billing the JANT as the largest basketball tournament Vancouver has ever seen. One of those family members watching on Thursday was Margaret Brown. She’s a Heiltsuk great-grandmother who came with her granddaughters to watch her great-granddaughter, also Margaret, play. “I try not to miss any [games]. I don’t know how many I’ve been watching. Lots,” she chuckled. Brown loves seeing the girls’ skill and teamwork develop, and she also loves seeing members of her nation come together at the JANT. The boys team, meanwhile, is preparing to defend its title from last year. McKnight, a Kitasoo First Nation member, said this year is bittersweet because a number of the players will be aging out—so it’s their last chance. Vancity Sons coach Chris McKnight sits with Gavin Bruce (second from right), Kobe McKnight (third from right) and the team’s youngest player Kallen Tait (fourth from right). Kobe McKnight, Chris’ son and the Sons’ shooting guard, is another player coming to his last JANT. In the fall, Kobe will start playing basketball for Douglas College. Kobe McKnight, shooting guard for the Vancity Sons, practices days before the start of the Junior All Native basketball tournament on March 15, 2018. Tshan said the great thing about this tournament is that the kids get to represent their families, their cultures and their nations through something they excel at: the game of basketball. This year, the tournament also has a theme centering on unity. “It's uniting all nations, all youth no matter what communities they're in through the love of the game,” said Tshan. The tournament will start with cultural performances at the opening ceremonies and the games kick off on Monday morning at Capilano University.